The choice of the proper probe is very important during magnetic measurements. The magnetic probe should provide high resolution images with good magnetic signal. Besides it should “survive” under high-humidity conditions. NT-MDT SI offers new development - high resolution long lifetime magnetic probes MFM01 and MFM10. Special protective layers help to avoid oxidation and increase the cantilever lifetime substantially. Sharp silicon tip with coating less than 40 nm allows obtaining magnetic resolution till 20-30 nm! 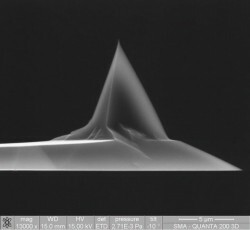 SEM photo of the MFM01 probe tip. Curvature radius is about 35 nm. Survival test – 30 days in high* humidity conditions! Total coating thickness – 30-40 nm*. Typical curvature radius of the tip is about 40 nm.